Tuck away in the southern west fringe of South China Sea, in a humble village of Chendering, Kuala Terengganu, Malaysia, housewives and young girls weave songket in their backyard as a tradition. This is the home where the finest woven songket can be found, along with the gentle ocean breeze, coconut trees and rustic charm of village life. In this part of the world, the tropical climate and the fertile soil blessed the native with an abundance of plants. Long have the Malay exploited the medicinal properties of these plants, from its flowers, roots, leaves, fruits, bark and seeds. In appreciation, they were immortalised into arts and crafts. Various sweet-smelling plants, food, people, animals, inanimate objects, natural landscape patterns and motifs - sometimes abstract, in other times vividly captured - are the primary sources of inspiration. For a long period of time, the traditional weavers lived in a world very close to nature. In the rural villages they see things with discerning eyes, capture the intricate designs of nature and incorporate them as motifs and patterns in their creative works. 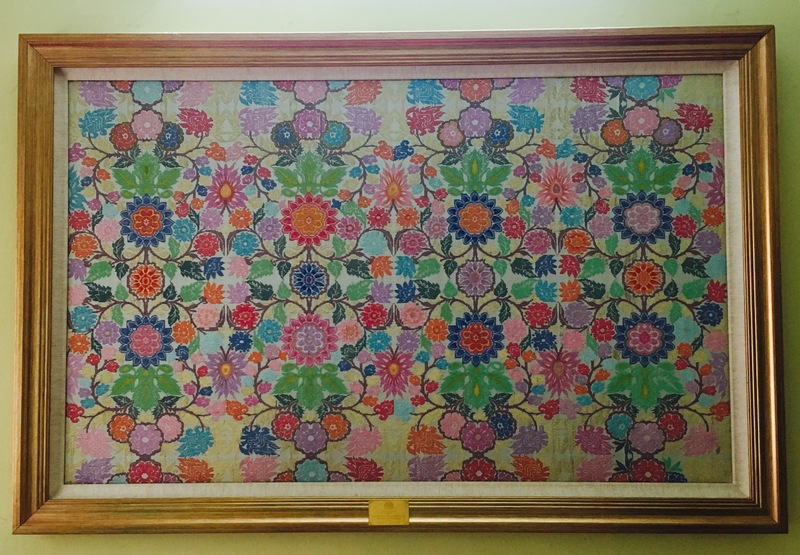 As a result, most of the motifs in songket are designed and named after the flora and fauna of their environment. Examples of flower motifs are bunga tanjung, bunga kemunting Cina, and bunga cengkih; and of fruits are buah manggis, buah kesemak, buah delima and buah cermai. A favourite motif from nature is pucuk rebung which is the young, triangular shaped bamboo shoot. Motifs from the animal kingdom include unduk--unduk (sea horses), gigi yu (shark's teeth), gigi belalang (grasshopper's teeth), kepala lalat (head of the fly), siku keluang (flying fox's elbow), kaki lipan (centipede's legs), jari buaya (crocodile's claws) and jari gagak (crow's claws). Another source of inspiration for the songket weavers are the shapes of a great variety of Malay cakes and sweetmeats that are usually arranged in geometrical designs on plates. Sometimes the shapes of the cakes themselves lend their names to evoke suitable motifs. For example, we have the potong wajik (a diamond-shaped cake of glutinous rice), tepung talam (also a diamond-shaped cake), madu manis (honey sweet cake), potong seri kaya (egg jam cake) and potong putu (cakes of rice flour or peas). Activities around the village have also made some impact on songket designs, like the bunga tiga dara (the three maidens), lawi ayam (the cockerel's tail feathers), bunga pitis (coins), tapak catur (squares of the chessboard), biji peria (bitter gourd seeds). Further a field we have motifs with names like kota raja (the ruler's fort) and cogan (ruler's mace). The moods and temperaments of nature too are depicted,for instance, the swirling and eddying water of the rivers and rapids is captured in the air muleh motif and the trailing clouds in the blue heaven are seen in the awan larat motif, which is represented by a chain of 'C' or horizontal 'S' -shaped patterns. The chain of bays or lagoons along Malaysian beaches has created a unique motif called teluk berantai which is also known as jong sarat (the well-laden junk) in the state of Kelantan. Motifs that are derived from the world of beliefs and the cosmos include lidah bota (the demon's tongue), bunga semangat (inspirational flower), sinar matahari (the sun's rays), bintang beralih (the changing star), pergunungan (mountain range) and tampuk semesta (core of the universe). Animal motifs are highly stylized and modified because Islam discourages a realistic portrayal of animal and human figures in art. 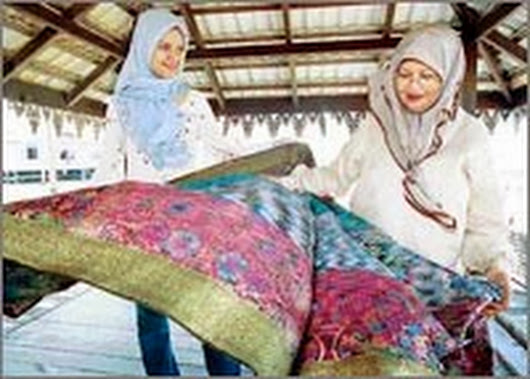 Most songket motifs, because of the nature of the weaving technique, have the tendency to become geometrical in design and this characteristic has helped to diffuse an exact portrayal of human figures or animal shapes. As a matter of fact it is extremely rare to find a motif depicting humans. Even the bunga tiga dara does not display anything close to the figures of the three maidens but depicts a floral pattern that resembles a tulip with three petals.